Wash the pumpkin as we’re not going to peel it as both the Mantuan pumpkin and the butternut squash have very thin peel which we can eat. If your pumpkin has a thicker skin or you are not comfortable with the idea of eating it, just peel it. Slice the pumpkin into 1 inch thick slices and place them onto a baking sheet lined with parchment paper. 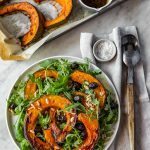 In a bowl mix the extra virgin oil with salt, a few rounds of freshly ground black pepper and a generous pinch of grated nutmeg, then brush the pumpkin slices with the olive oil. Bake for about 35 to 40 minutes, checking them halfway through cooking. Remove the pumpkin from the oven when it is soft enough to be easily cut with a fork and golden on the surface, almost caramelized on the edges. Meanwhile prepare the salad dressing, mixing the extra virgin olive oil with the aceto balsamico and the apple cider vinegar. Add the grated lemon zest, then salt and black pepper to taste. Place the warm pumpkin in a tray, alternating it with the rocket, then add the black olives, the shaved Parmigiano and the toasted pine nuts. Dress with the vinaigrette and serve immediately. All ingredients can be prepared in advance and assembled just before serving them. The pumpkin can be warmish or cold. It is better to avoid a very hot pumpkin just removed from the oven, as it will tend to cook the tender rocket leaves. Instead of pine nuts you can also use two tablespoons of toasted hazelnuts, roughly chopped. To learn more about the Mantua pumpkin, read here.